More than 4 million people wear braces, and while associated with childhood, one in four of those patients are adults. Orthodontic treatment is not simply aesthetic, misaligned teeth can impact the health of your teeth and gums, cause jaw pain, and in extreme cases, it may even be so difficult to eat that digestive issues may arise. If orthodontic treatment is desired or needed it is never too late to correct misaligned teeth or jaws. If you have made the decision to see an orthodontist, or are considering one, the following is a basic guide. How do orthodontics and braces straighten teeth? While definitely improving a person’s smile by correctly aligning teeth, orthodontic treatment creates a lifelong foundation for a healthy bite, and therefore healthy teeth, gums, and jaws. This is accomplished by gently, yet steadily applying pressure over a period of time to nudge teeth into a correct and healthy position. This constant pressure moves teeth through a process called bone remodeling. Why bone? It is the gradual breakdown and rebuilding of the jawbone, thus remodeling, that actually allows the teeth to move, albeit very slowly. Teeth are firmly socketed to both the upper and lower jawbones through Periodontal Ligament. With the help of orthodontic treatments, also known as braces, applying pressure to the teeth, the surrounding ligament transfers that pressure to the jawbone, which in turn breaks down in the immediate area, where the pressure is applied. In the space created by this shifting, the jawbone then naturally rebuilds over time to keep the fit of the teeth snug and the position permanent. In addition to pressure, successful repositioning of teeth will also depend on patience. Bone remodeling takes time, more so for adults than children, because unlike children, bones are no longer growing. What sort of issues are corrected or improved with braces? The following is a list of dental issues, which orthodontic treatments can avoid, alleviate, or correct. In many instances, more than one issue is addressed, because many times if one issue is allowed to develop, or goes untreated, secondary issues can arise, further complicating a patient’s oral health. An example of how one issue can foster more than one problem is spacing. Often when there is extra space between teeth, food can be packed into that space, and difficult to fully and regularly clean. If food is continually caught in spaces, then cavities, periodontitis, abscesses, and more may develop. There is no wrong time to seek an orthodontic assessment, but if and when treatment is best really depends on the individual’s specific dental needs. Now with that said, there are a few guidelines that can help make the decision to make an appointment. The American Academy of Orthodontists (AAO) recommends that an initial evaluation by an orthodontist should take place by age 7, even if the child’s teeth appear to be straight. Identifying potential problems early will allow the orthodontist to draft a plan for monitoring, and, if necessary treating, in order to avoid serious problems from developing, and to achieve results that may not be possible once the jaws and facial bones have stopped growing. Adults primarily seek orthodontic treatment for cosmetic, corrective and restorative reasons. Because adult jawbones have stopped growing, the timing of when to see an orthodontist depends on desire, and in many cases the dental or medical necessity. What should not hold any adult back from seeking treatment is age. Because age is simply a number, every year more and more adults seek orthodontic advice, care, and treatment with great results. We offer two types of orthodontic treatments, including traditional metal braces, clear and ceramic braces brackets, and clear correction trays. Again, because each patient requires and should always receive individually tailored care, only by discussing the treatment options with the orthodontist and understanding the personal demands of the treatments will it become clear which type of treatment is best. Because advancements in technology, orthodontists now use high grade stainless steel, making today’s metal treatments lighter and more comfortable. The metal brackets, which are attached to teeth using bonding material, hold in place the metal archwire, the device that puts guided pressure on the teeth, and therefore the bone, resulting in movement. We use the InOvation system which provides a shorter and more comfortable treatment time for patients. 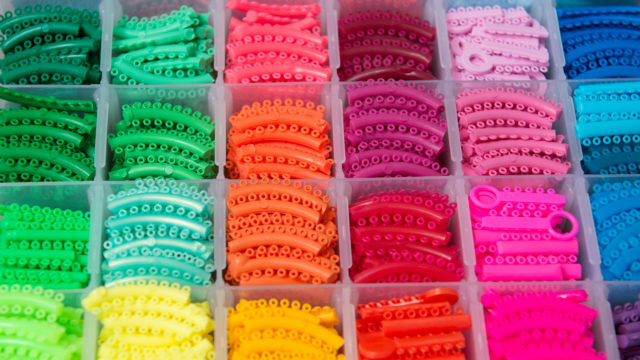 Our patients can choose to have silver or gold metal brackets, and many people enjoy picking colorful O-bands to frame their grin. Many patients select clear brackets or ceramic braces, consisting of tooth-colored brackets, which are a less-noticeable orthodontic option. Both types of braces are bonded and applied to the teeth using the same method as metal braces. Special care must be taken to thoroughly clean teeth while wearing braces to ensure that all food particles have been removed, otherwise gingivitis, plaque, tartar, and cavities may develop. Clear correction trays have truly revolutionized orthodontic treatment because they are not only removable, but they are nearly invisible. These trays, also called aligners, are made of hard clear plastic that is custom crafted to fit over teeth, giving a seamless appearance. After the initial tray, the patient then receives a new and slightly different tray every few weeks. Each removable aligner will move the targeted teeth bit by bit until the teeth are corrected. At Jefferson Dental we offer ClearCorrect correction trays to patients who need orthodontics to correct certain oral health issues. These trays can be worn at all the times, except for eating, drinking, brushing and flossing. Patients will need to wear the trays anywhere from 20 to 22 hours a day. Many of the issues orthodontic treatments address will prevent serious conditions that may have severe consequences to a patient’s dental and general health. Braces vary in cost based on several factors – length of treatment, type of treatment, orthodontic appliances, and any additional treatment (such as extractions) that are needed in addition to orthodontics. Moreover, some insurance plans may offer coverage for braces and orthodontic appliances. Because we understand that having well-aligned teeth are a necessity for a healthy life, we are offering $400 off orthodontic treatments. Call to schedule your appointment at one of our 10 Jefferson Dental ortho locations!